Experienced, Professional & Insured Call 480-792-1115 & Press 4 for our service department. Looking for a qualified pool table mover? We are Professional, Experienced and Insured. You can trust us to move your table professionally and safely. 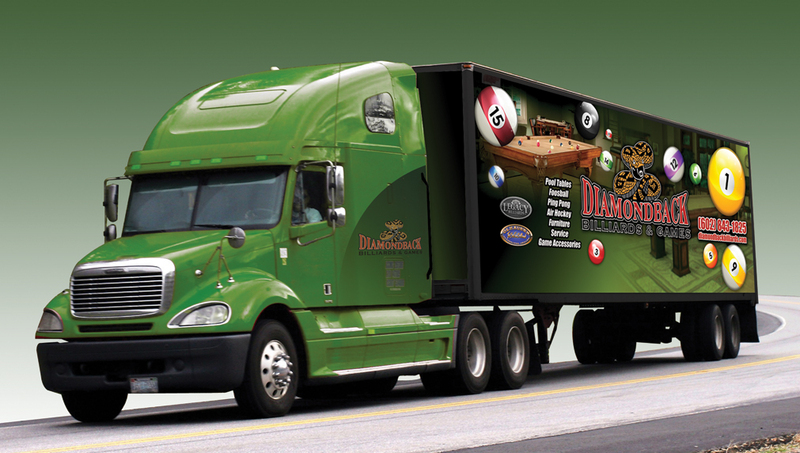 Diamondback Billiards moves over 1000 pool tables a year in the greater Metro Phoenix Area and beyond. In fact we take great pride in our service department and it could be said we are experts at moving pool tables. Operating three, two man teams in fully equipped and covered box trucks and vans throughout Arizona. We have the know how to move your pool table professionally and safely. With Pool Tables and Billiards tables weighing in over 800lbs, a professional pool table moving service gives you peace of mind that your table is well cared for and will play as well or better when we are done. We have the knowledge and man power to get the job done. Each team is led by an experienced senior pool table technician with over 5 years of experience in the industry. Some of our technicians have been on the job for over ten years. Added to their experience, our pool table movers can answer almost any pool table related question under the sun. If they don't know the answer one quick call can generally answer your question. Our prices are fair and competitive and you can count on our staff to quote you an accurate price to meet your specific needs. You can reach our friendly and informative service staff at 480-792-1115 then press 4 on your phone to reach our service department. Our experienced team can to deliver your table anywhere you need it to be. From a quick move inside your home or a complete break down, packing, crating and shipping to another location. We have all the tools, know how and a network of over the road moving companies to you mover your table safely and professionally. If your unsure of who to use as an over the road cargo service, we have a network of trusted cargo companies we can offer you as resources. We can even assist you with the logistics of the move or handle the move in it's entirety. Our network will move your table anywhere within the continental US. Just call! 480-792-1115, you will be glad you did! To read about other locations we service. Visit our Pool Table Moving Directory.